After reading Book 1 in the Blackcoat Rebellion, Pawn (reviewed here), I was happy to get an ARC of Book 2, Captive. This volume may seem fairly short, clocking in at just 298 pages, but it’s full of action. SPOILER WARNING: This review will contain spoilers for Book 1, Pawn. THE PLOT: At the end of Pawn, Kitty Doe had discovered that the real Lila Hart was still alive, and Daxton Hart was actually a masked former V. Kitty is still playing the role of Lila, but she hasn’t told Knox (real Lila’s fiancé) that Daxton doesn’t have amnesia like he’s pretending. Knox is trying to lead the Blackcoats, but Kitty is stubbornly throwing some chinks in his plans. Then Kitty is caught trying to get papers revealing fake Daxton’s real identity out of his office. She manages to hide the papers, but her boyfriend Benji is killed…by Knox. Daxton has Kitty sent (as Lila) to Elsewhere, the horrible prison/hunting grounds for Is and criminals. Kitty is rebranded with an X, losing her precious VII forever, and somehow has to manage to survive Elsewhere. But does she even want to survive without Benji? Whose side is Knox really on? Who is fake Daxton? And why were there papers on Kitty’s pre-Lila past in the safe? MY TWO CENTS: The action really starts once Kitty arrives in Elsewhere. We’re introduced to a bunch of new characters: prison guards, prisoners, snitches, and secret Blackcoats. The reader doesn’t know who Kitty should trust, and there are several curves I didn’t see coming. I think the overall plot moved along quite nicely by taking Kitty away from Benji and Knox and throwing her into a den of wolves. It also helps develop Kitty’s character, since much of the action is instigated by her immaturity at the beginning of the book. We finally learn about Kitty’s heritage. BOTTOM LINE: This was a fairly tense read. I enjoyed this book as much as, maybe more than, its predecessor, and am very much looking forward to the final book in the series, Queen. TEACUP RATING: I give Captive four out of five teacups for suspense and action. 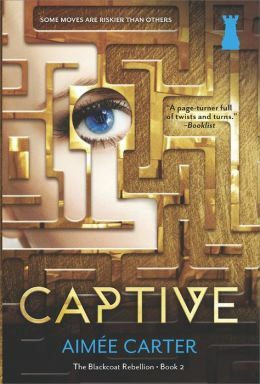 ON SALE DATE: Captive will be available in hardcover and eformats on November 25, 2014. Note: Review is based on an ARC provided by the publisher via Amazon Vine in exchange for an honest review.